Over the past two decades, beginning with The Residences on Georgia, progressing through the Shangri-La Vancouver and Toronto, the Woodward’s re-development, the Fairmont Pacific Rim and Vancouver House, Westbank has evolved into one of North America’s leading real estate developers. The integration of public art into large, complex mixed-use developments became the company’s signature, but over the years, Westbank began to think about their projects as more than just buildings. Although artistry remains essential, Westbank’s real ambition is to create opportunities to shape the entire build-out of a city. Adopting this bold new mission was a giant leap forward – not only from technical and sustainability perspectives – but for all aspects of the practice. 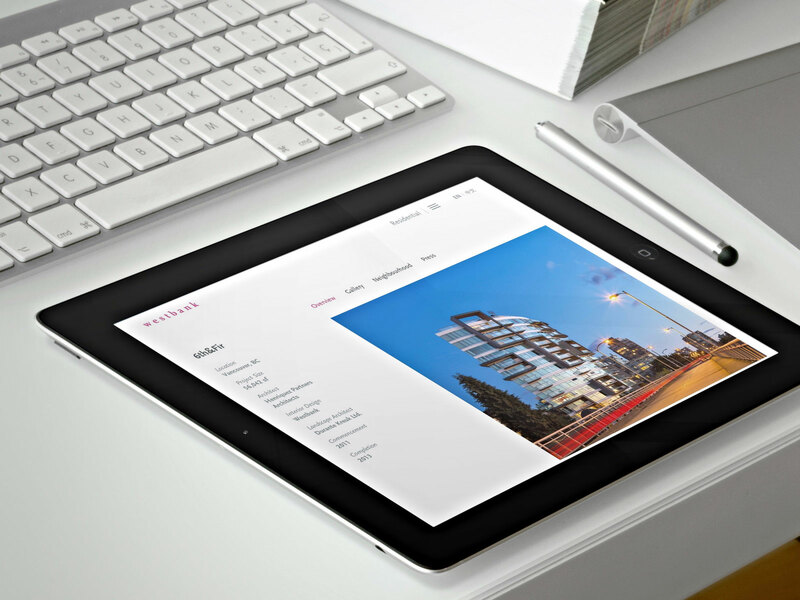 With it came the opportunity to create a new digital strategy for Westbank. Westbank engaged Signals to help lead their digital transformation. 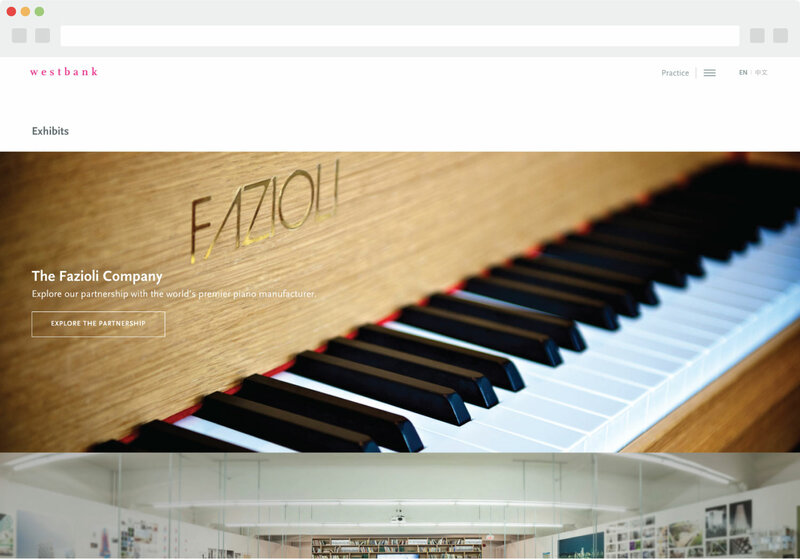 We were tasked with redeveloping all of their digital assets, including creating a dynamic corporate platform to showcase the company’s body of work. The team at Westbank gave us feedback on their existing portfolio site and set out their goals for the new site. Some requests were very specific, others were more open-ended. They asked us to build on their existing identity and to incorporate Building Artistry (link to amazon), a recently published 532-page book which documents the twenty-year evolution of the practice. 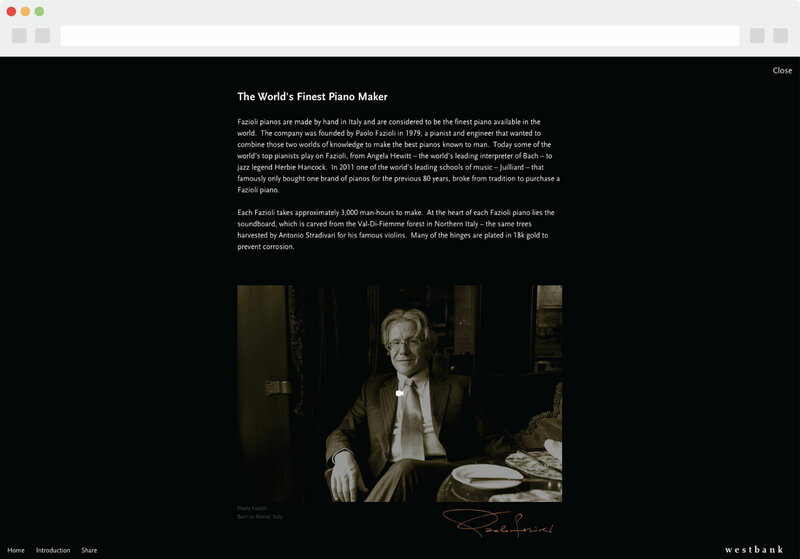 We also needed to find ways to make the site more transactional, leverage their great photography and promote current projects, public art, press and listings. Above all, they were looking for a “simple & intimate” digital experience. Westbank’s high expectations, commitment to their vision and passion for the work made this a dream project, although tight timelines and shifting priorities were the harsh reality. The Westbank visual identity, developed by Terry Zacharko, is intentionally small and intimate. The shot of magenta represents their energy, creativity and most importantly, passion. 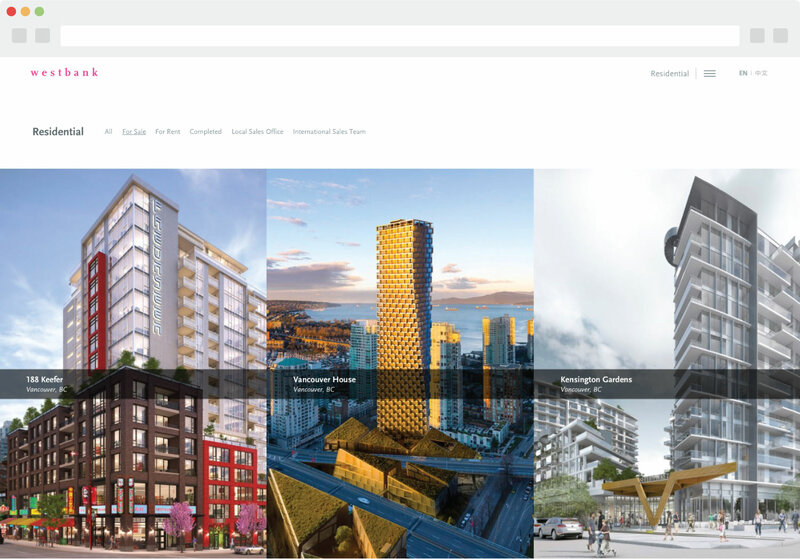 When it came to establishing digital styles and standards, the watchword was restraint, taking care to showcase Westbank’s work, rather than our website design. 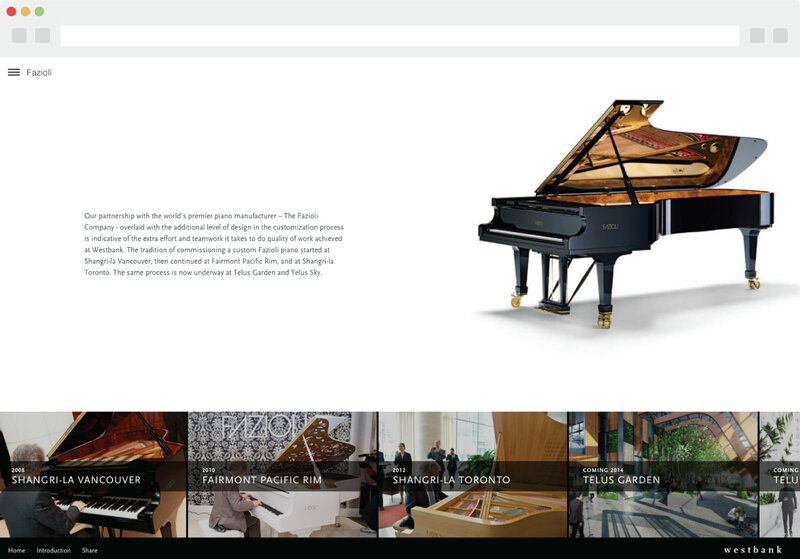 Our primary goals were to showcase the artistry and pursue the potential for public engagement, so we focused on features and functionality that aligned with the information architecture and available content. Building on Drupal, within a responsive framework, we considered new devices and a variety of form factors. In a large, artistic practice, the demands of creative autonomy often conflict with the need for central control of publishing. We brought the key players together to establish a shared vision for future content and campaigns. Next, we mapped out the strategy, based on five key goals: mission, identity, audience, dialogue and technology. Each goal had its own set of set of policy, program, and tactical recommendations. From there, we developed the unifying concept. We synthesized the themes and goals into the single concept of an online museum. This became the organizing principle for Westbank’s digital presence: a digital destination dedicated to stimulating dialogue about architecture, art and city building by granting access to Westbank’s collection of beautiful buildings, exhibits, public art, footprint and community. With our digital strategy and core idea approved, we worked diligently to create a digital experience that would connect the public with Westbank’s mission of city building. 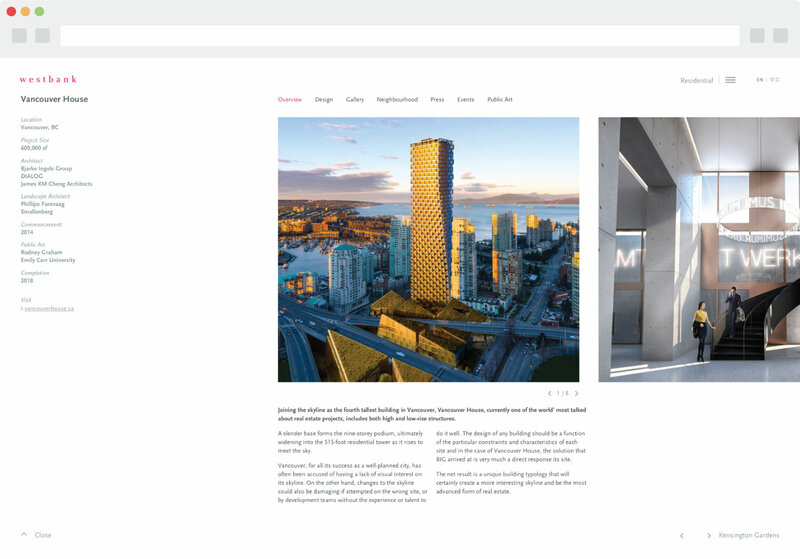 While we were in the process of designing the corporate site, Westbank was developing new project marketing campaigns, so it was important for us to work closely with their team to define a digital style that would feel consistent and extend Westbank’s identity online, through every interactive touch-point. During this process, we developed a new digital language for Westbank – one that focused on great typography and minimalist design, where projects, public art and photography told their story. 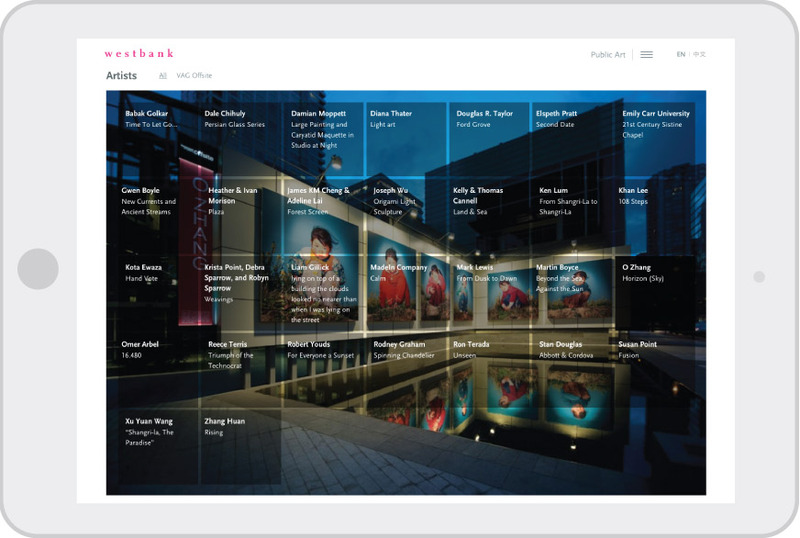 Seeing Westbank as an emerging global brand, we set out to design a flexible framework with dynamic content nodes that could feature individual projects. 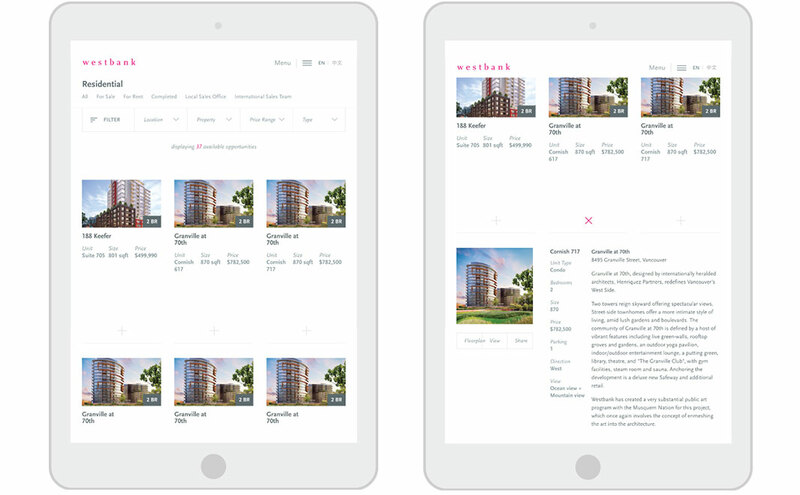 We crafted a system of components that could be repurposed around the site, translating naturally to mobile or tablet devices without sacrificing design integrity. This approach would enable Westbank to promote specific project content within one cohesive framework. 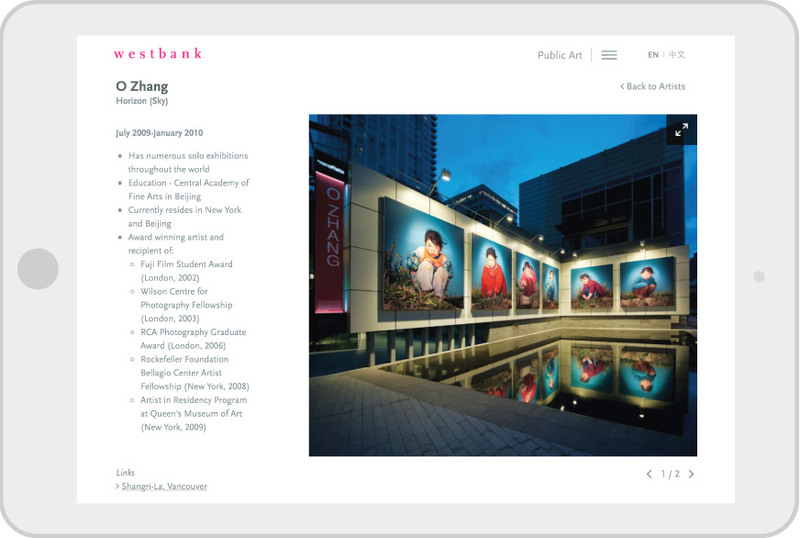 In addition to documenting Westbank’s work, the redesign strategy considered the organization’s communication needs and web publishing fundamentals to improve access to content, collections and community across all platforms. This included opportunities to fill in the gaps between project marketing cycles. Putting a solid foundation in place will allow for more multiplatform brand leveraging in the future. Westbank had cultivated a brand that was “private” in essence – now we were being asked to build the company’s digital presence, in a very public way. Our mandate was to keep the web experience simple and private, too, while, at the same time, pushing industry boundaries. We brought innovation to the experience through thoughtful design, careful consideration of the subject and respect for our audience’s intelligence. Focusing our energy on elevating the user experience provided a new model for development companies. The digital transformation has become part of a greater transformation for Westbank and has impacted its culture, operations, talent recruitment and allocation of resources. The company’s willingness to accept and prioritize these changes is a testament to their vision and determination to advance their building mission. An ask for a “simple & intimate” site experience is usually anything but. When the ask is accompanied by multiple constraints, it quickly becomes complex and the list of requirements grows. For Westbank, we ended up creating a beautiful facade in front of a complex series of interactions responding to a wide range of use cases. Working to achieve this took more sweat than we care to admit, and the end goal was (ironically) to make it look almost effortless. We’ve come to believe that simple digital design is one of the most unforgiving forms of design. This is a medium where flaws and inconsistencies have nowhere to hide. To make simple work for Westbank, we focused on the use of a very tight typographic system. Countless explorations were required: the more we explored, the closer we got to designs that met the project’s ambition. With simplicity in mind, every design element had to have a clear purpose and use. Handcuffed by timelines and high expectations, we raced to develop ideas that could be strategically applied across projects. Our framework allowed us to anticipate and respond to urgent design and development requests. And while not all features are wholly interchangeable, some components can be strategically leveraged to deliver a consistent experience through a unified design language. True to nature, a design system built on consistency and attention to detail not only helps create a unified experience, but helps facilitate the creation of the system, itself. Working closely on such a broad range of corporate initiatives in a short span of time allowed us to immerse ourselves in the passion and creativity that makes Westbank such an exceptional practice. The project has emboldened us to approach new projects with much larger ambitions.